I made a batch of refrigerator pickles and the garlic on the bottom of the glass jars turned blue. Apparently, the enzymes and amino acids react with vinegar causing ths reaction. Needless to say, the blue garlic kind of freaked me out. I just heard about this the other day. It's apparently harmless but still freaky. I just recently learned about this as well. Garlic contains Anthocyaninins, water-soluble pigments. With acid conditions, it may turn blue or purple. It also contains sulfur compounds, which may react with copper in water to form copper sulfate, a blue compound. Often occurs in jars of pickle, it is recommended to eat the pickles and discard the garlic. I believe it only turns blue when using iodized salt. The pickling salt should not make it turn blue. I only used pickling salt. I believe the reaction is to acid in the vinegar. Location: 25 miles southeast of Waterloo Texas. I read it was old garlic that did it. I came into this life with a backbone and I'll leave it with one. I look on Google as I am sure you have. It seems there is a whole new internet just for blue garlic. I have had it happen a few times and it is safe to eat. In my experience it usually happens if the garlic has been banged up a bit before pickling. Try rolling a couple of cloves together in your hands to loosen up the skin and those cloves are almost guaranteed to turn blue. I always use/eat these, they taste the same as white ones. When we try to pick out anything by itself, we find it hitched to everything else in the universe. Believe those who seek the Truth: Doubt those who find it. I pickle green tomatoes every year and always use extra garlic as fresh as i can buy. they turn blue/green almost always. They taste the same as the few cloves that stay white. My mom makes a ton of jars of pickles every year, it is her specialty, and it happens about 1 out of 10 jars. We still eat the pickles and the blue garlic. “Enter by the narrow gate; for wide is the gate and broad is the way that leads to destruction, and there are many who go in by it. Because narrow is the gate and difficult is the way which leads to life, and there are few who find it." Link and information we use when folks ask our garlic farm about blue garlic. Users of bottled garlic in vinegar are occasionally alarmed to find that the product has turned green or blue-green. These colour changes do not make the product unsafe but are obviously undesirable. The problem of garlic changing colour is associated with the addition of acid which changes the normal pH of the product. This is precisely what is required to ensure that the garlic remains safe but the change in acidity brings about chemical changes in pigments in the garlic. All plant materials contain various pigments some of which change colour as the pH of the plant tissue is changed by the addition of vinegar or other acids. The most common of these pigments are the anthocyanins which may be blue, colourless or red depending on the pH. These pigments may be involved in some colour changes observed in preserved garlic but American scientists have identified another more general explanation. Certain amino acids, natural components of foods, are responsible for many of the pigment characteristics of the onion family which includes garlic. The American scientists have shown that the outstanding difference in composition between garlic which turns green and garlic which does not is the presence of much higher levels of one particular amino acid in the green garlic. It is not possible to tell by looking at untreated garlic whether it is likely to become green on crushing and acidification. However the work reported indicates that if garlic bulbs are stored for four weeks at a temperature above 23°C prior to processing, the production of the green pigment is prevented. This may not be practical at the domestic level, but could be a valuable precaution for commercial producers. Find out more about Food Quality & Safety. A row of garlic was pulled for drying. The bulbs are solid with no bursting so some were left in the ground to mature more. The scapes were left on and formed bulbils or seeds which can be used in cooking. I also wrapped some clusters in gauze to mature into bulbils. The gauze prevents dispersal as they mature. Some elephant garlic was also pulled. 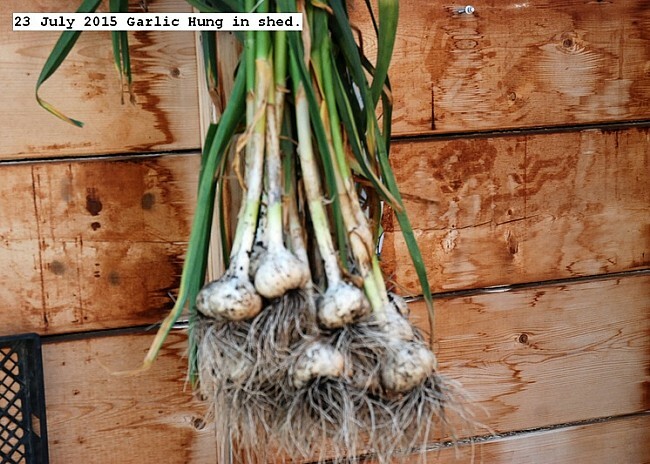 Elephant garlic has nodules on the bulb which are clones which are viable and can be planted. For the main crop, for the seed cloves, I let the bulbs burst which makes for larger cloves for planting. I find this seems to have little effect on shelf life in practice. About 80 bulbs of garlic was harvested. The seed scapes were removed which is usually done earlier. 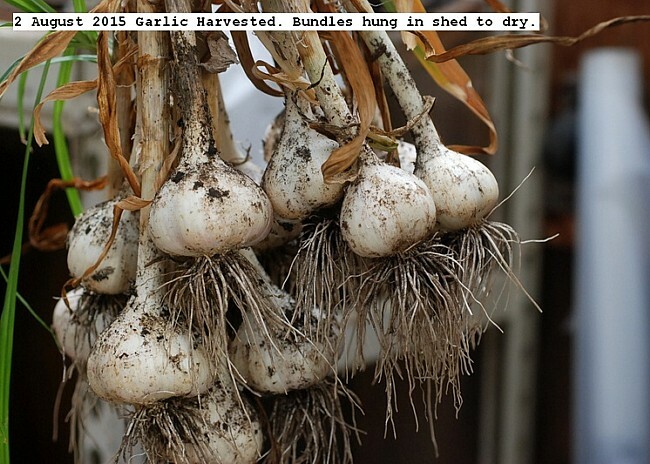 The bulbs were hung in the shed to dry duration for about three weeks then will be trimmed for storage.Eight bulbs were left in the ground so the seed pods can mature.They are covered with gauze to contain the seeds, since they disperse when ripe rather quickly. The seeds are called bulbils which are small clones of the bulb in the ground. Nice bulbs! I'm just letting my garlic flower and go to seed in hopes I'll have more next year since I only have a few this year. I don't hope for bulbs as big as yours. I got my original bulbils from an elementary school project from 5 years ago. I have no idea what the variety is but the flowers and scapes are very nice.